L.A. celebrated the fifth edition of city’s biggest two-wheeled block party on Sunday. KNBC-4 captures the day through Twitter comments and photos, as well as weatherman Fritz Coleman’s helmet cam. The new route took riders past USC to Exposition Park, as well as MacArthur Park, Boyle Heights and Chinatown. Personally, I enjoyed the new Boyle Heights and Figueroa legs, but Chinatown didn’t really work for me. My own CicLAvia turned out to be a disappointment, as mechanical issues kept me from leaving home until afternoon; by the time I got there, I had just enough time to ride the route with no stops, finishing just as the traffic-blocking barriers were removed. However, I did capture the ride on my own helmet cam. If I can figure out how to turn it into a Will Campbell-style timelapse video, I may put it online in a day or two. Meanwhile, Claremont and Pomona may get a CicLAvia of their own. I’m not sure if I’ve really been too busy to write this, or if the subject just turned my stomach. The second street racing driver involved in the death of pro cyclist Jorge Alvarado was sentenced to a pat on the back slap on the wrist this past week, as it seems the judge did everything but thank him for reducing the excess cyclist population in San Bernardino County. Like his co-defendant Patrick Roraff, Brett Morin was sentenced to a mere 90 days in jail — released for time served — and three years probation for recklessly killing Alvarado in what had previously been described as a street racing incident, but is now considered mere automotive horseplay. Somehow during the course of the non-trial the drivers’ speeds were reduced from an estimated 75 to 80 miles per hour to a relatively sedate 64 to 66 mph. Yet even with the slower speeds, Alvarado is still dead. Not that the judge seems too concerned. The Inland Valley Daily Bulletin quotes him explaining the rationale behind his sentencing. “Without question, this is a horrific event that everyone in the courtroom would take back if they could,” Judge William Jefferson Powell said. Powell went on to say that nothing done on Wednesday would bring Alvarez back and that he did not see a reason to destroy another young life. I sincerely hope someone reminds him of that statement the next time a defendant is on trial for shooting someone, since a stiff sentence wouldn’t bring that victim back, either. Of course, it would be nice if the paper could get the name of the victim right. Let alone if the judge had given as much consideration to the victim as he did his killers. Or placed as much value on the life of a cyclist as California courts do the life of a dog. A harsher sentence, the judge decided, would compound the tragedy of Alvarado’s death… Powell explained that he was seeking to protect the public and hand down punishment for a tragic death without destroying the life of a young man who has no prior criminal record and, whom the judge said, has led an upright and productive life. Other than taking the life of an innocent cyclist, of course. And I don’t know about you, but I don’t feel very protected. The blame for this travesty of justice clearly rests with the judge, as the prosecutor claims he had nothing to do with the plea deal, which was made directly from the bench,. Hopefully San Bernardino County cyclists will remember this case when Powell comes up for re-election. Not surprisingly, accused hit-and-run driver Michael Jason Lopez pleads not guilty in the death of Newport Beach cyclist Dr. Catherine “Kit” Campion. He’s facing eight years for felony hit-and-run causing death, and misdemeanor vehicular manslaughter without gross negligence, with a felony enhancement for a 1993 burglary conviction. Now that L.A. has cancelled them, there’s evidence that red light cameras really do make roads safer. Flying Pigeon shop owner Josef Bray-Ali finally sees some success in his campaign for a car-free Lincoln Park. Urban bikewear manufacturer Swrve challenges two-time three-foot-law vetoing Governor Jerry Brown to a ride across Los Angeles; frankly, I doubt he cares any more than some judges I could name. What is bike advocacy, and who exactly gave you permission? An El Monte cyclist inadvertently prevents a kidnapping; thanks to Meghan Lynch for the heads-up. A Newport Beach councilmember and the city’s police chief will talk bikes on Wednesday. Laguna Beach considers a road diet to make way for pedestrians and bikes. Four CdM cyclists, three riding styles. BikeSD is now officially an advocacy group; if you live or ride in the San Diego, you owe it to yourself to sign up. It’s been a bloody year for pedestrians and cyclists in Rancho Cucamonga. A Santa Barbara motorized bike rider suffers life-threatening injuries in a right-hook collision with a 16-year old driver. Richard Risemberg takes a ride in the SLO lane. Santa Cruz cyclists enjoy their version of a ciclovia. Fresno cyclists remember a seven-year old bike rider killed by a drunk driver last July. Just Another Cyclist takes on an anti-bike zealot who complains about bicycle zealots like you and me; nice to see his insightful writing once again. Bicycling offers advice on buying a used road bike; my advice is be careful buying off Craigslist if you don’t want to support your local bike thief. Framebuilder Dave Moulton says Lance and Pat are harming the sport he loves. A bike riding Ogden UT writer says the city needs to do more to support cycling — including giving more tickets to riders for being stupid. After a cyclist is killed in a dooring, a Chicago Tribune columnist asks if cycling is getting more dangerous; bike advocate Steve Vance says no, but the realization of what it takes to keep us safe is. The usually rabidly anti-bike Daily News says it’s time for New York to build really separated bikeways. A judge criticizes the NYPD for stonewalling in the case of fallen cyclist Mathieu Lafevre. It’s not about bikes vs cars, it’s about building better cities. Reykjavík mayor Jón Gnarr apologizes for his negative portrayal of a cyclist in an Icelandic sit com. The only thing more disheartening than having your bike stolen is finding it stripped for parts; London’s Guardian offers advice on how to avoid just that. A sharks-eye view on the safety in numbers theory. A British judge calls for banning bikes from high-speed highways. A Brit cyclist asks for greater safety and courtesy after a head-on collision with another rider on a bike path. Scott novelist and bike advocate Town Mouse writes her elected representatives to ask for more bike funding; seems congratulations are due on her election to the community council. Greg LeMond, now officially the only American Tour de France winner once again, talks bikes, ADD, Lance and doping in an Irish radio interview. Floyd “I didn’t dope, oh wait, yes I did” Landis can’t call bike racing’s governing officials bad names anymore. Finally, an ode to putting your bike on the bus; thanks to our friends at the LACBC for the heads-up. And as usual, Britain’s Cycling Embassy offers a link roundup that puts mine to shame, if you have a few hours to kill. I’ll be filling in as guest editor of L.A. Streetsblog through Thursday of this week, as Damien Newton takes some time off to spend with his new bouncing baby girl. So please forgive me in advance if postings are a little light this week; I’ll do my best to keep up. I just hope they gave me the right password. Big breaking news from San Bernardino. I’ve just been forwarded an email indicating that Patrick Michael Roraff has entered a guilty plea in the death of rising pro cyclist Jorge Alvarado. According to the email from Velo Club LaGrange Race Program Director/Elite Men’s Team Manager Stu Press, Roraff pleaded guilty to charges today. He’d been charged with a single count of felony gross vehicular manslaughter with a maximum sentence of six years in state prison. Alvarado was on a solo training ride on Greenspot Road in Highland, northeast of San Bernardino on April 8, 2010 when a car driven by Roraff went out of control while street racing and hit Alvardo, who died at the scene. Roraff later apologized for his actions. The driver of the other car, Brett Michael Morin, was also charged in the same case; the San Bernardino County Court website indicates he’s scheduled for a disposition/reset hearing on August 15. Roraff will be sentenced at 8:30 am on August 6th, in Department S26 of the San Bernardino County Court. According to Press’ email, cyclists are encouraged to attend and make a brief (2 – 5 minute) victim impact statement stating how Alvarado’s death has impacted you. That can be anything from whether you knew him and suffered a direct loss, or if it has affected you in other ways, such as being afraid to ride for fear of similar incidents. While his plea change suggests that a plea deal may be in place, a big turn out could still influence the sentence the judge imposes. As many of you may know, Stephanie Segal was scheduled to be sentenced yesterday for the drunken hit-and-run death of cyclist James Laing in Agoura Hills last October. However, when there was no word last night on the sentencing, I reached out to cyclist/attorney Dj Wheels to see if he’d heard anything. As it turned out, he’d already checked with the court clerk, who informed him that the hearing had been continued to November 29th; no reason was given. Personally, I’m hoping the judge will give us a strict sentence we can be thankful for around Thanksgiving, instead of a terrifying slap on the wrist just before Halloween. Wheels also reports that Shawn Fields is appealing his seven-year sentence in the drunken hit-and-run death of 17-year old cyclist Danny Marin, case number B236186. His opening brief is due in mid-December; however, he’s still waiting for an attorney to be appointed, so expect a delay. And a trial date has finally been scheduled for Patrick Roraff in the alleged street-racing death of pro cyclist Jorge Alvarado in April of last year. A pretrial hearing is scheduled for December 19, with a trial readiness conference January 20th, and the actual trial is set to begin on January 23rd. As Wheels notes, we’ll have to see how firm those dates turn out to be. After all, Roraff may have some more soccer matches scheduled. School is back in session almost everywhere now. So be especially careful riding around schools, particularly at times when parents are dropping off or picking up children. Someone passing by on a bike is likely to be the last thing they’re looking for in the mad rush to get back to their school routine. Despite seeing countless reports of cycling collisions throughout the U.S. and around the world — just a handful of which you’ll find below — I haven’t gotten any news of serious cycling incidents in the SoCal area. I always hold my breath on three day weekends — the 4th of July was particularly bad. And sometimes, it takes a few days for news to filter in, as the press returns to work and police reports slowly leak out. But in this case, no news really is good news. Dj Wheels reports that motions to dismiss or reduce the charges against Patrick Roraff, the teenage driver accused of killing pro cyclist Jorge Alvarado while street racing in April of last year, have been denied. However, he still gets to travel to Texas to play soccer with his teammates, 17 months after his alleged victim was run down. Meanwhile, Long Beach Fire Captain John Hines faces a preliminary hearing today in an Orange County courtroom for critically injuring a cyclist in an allegedly drunken Seal Beach hit-and-run. Maybe he’ll meet Renato Demartino, who is scheduled for a hearing today in the same courthouse; he’s accused in the Tustin hit-and-run death of cyclist Marco Acuapan last April, four months after Demartino allegedly ran him down. I wonder what they would talk about. New bike lanes hit the pavement on First Street in Boyle Heights. Meanwhile, Zeke’s L.A.-based brother Dave reports that work has begun on new bike lanes on Cahuenga Blvd from Franklin to near the Hollywood Bowl; eventually, they should reach all the way to Lankershim. 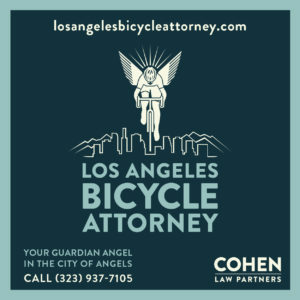 Damien Newton wants your questions for bike lawyer Howard Krepack. The next meeting of the nearly named group to re-envision North Figueroa as a Complete Street takes place at 7 pm on Friday, September 9th at Flying Pigeon Bike Shop, 3714 North Figueroa. New signs pop up urging cyclists to share the L.A. River Bike Path with pedestrians in Elysian Valley. Santa Monica’s Ocean Park Blvd should soon be a significantly greener — and bike-friendlier — street. Santa Monica Spoke invites you to RSVP for dinner, bikes and cupcakes with Elly Blue. A driver reports hitting a bike in the HOV lane on the 10 Freeway in Baldwin Park, but no word on whether it was being ridden or just laying in the lane; we’ll hope for the latter. HuffPo offers more than your daily dose of celebs on bikes; thanks to Rex Reese for the heads-up. Cyclists and motorists owe each other respect. According to Tucson Velo, a driver accused of hitting and killing a cyclist had previous DUI arrests; nice work keeping a dangerous driver on the streets until he finally killed someone. Tour de Fat draws 12,000 cyclists in my hometown of Fort Collins CO; it will be here on October 8th. After an Idaho boy’s new bike is stolen, replacement offers pour in. A Missoula cyclist is found dead on the sidewalk in an apparent solo collision; of course, as cyclists know but police can’t seem to figure out, you don’t have to actually hit a rider to cause a cycling collision. A Minnesota triathlete dies one month after a mountain biking accident in Colorado. A Vermont cyclist died after bypassing barriers closing a road damaged by Hurricane Irene; seriously people, when the road is closed, there may be a reason for it. A New York cyclist is killed after running a red light; that’s why you don’t do that, people. Cyclists open fire near the nation’s capitol; thanks to DC for the heads-up. A 75-year old Florida cyclist is killed by an 84-year old driver in a SMIDSY;* fortunately for the driver, failure to see your victim is the universal Get Out of Jail Free Card — especially in Florida. Toronto Streets should be a delight, not a hospital waiting room. The Cycling Embassy of Great Britain officially takes flight; now the hard work begins. Progress is slow on London’s cycling revolution. Potholes in Sheffield UK threaten that city’s bid to host a stage of the Tour de France. Great bike art from Dublin. Instead of making the roads safer, Aussie authorities idiotically consider making hi-vis vests mandatory for all cyclists; maybe that way drivers will finally see the riders they run down. Another pro team bites the dust, as the Scheck brothers’ Leopard-Trek team merges with Team RadioShack and a bunch of riders prepare to get the boot. Investigation shows pro cyclist Riccardo Ricco gave himself a botched transfusion. A Chinese banking official is held for killing a cyclist while driving drunk. Finally, David Hembrow reads L.A.’s new bike plan, finds it critically lacking and concludes we’re being fed a line. And the Economist says America is no place for cyclists, with a few notable exceptions. *Sorry Mate I Didn’t See You. I’ve gotten reports of an intentional assault on a cyclist in Santa Monica on Wednesday. Cyclist Will Ashe sends word that the driver of a black Lexus GS 470 deliberately rear-ended another rider on Colorado Ave, then fled the scene. Police were called, but the victim got the license plate number wrong. I can tell you from personal experience that it’s hard to get the number right when you’re trying to pick yourself up off the pavement. Be on the lookout for a car that meets that description driven by an African-American man. But remember that there are probably hundreds of cars like that on the Westside. Call the police, and let them deal with it. Update: In my rush to get this online last night, I neglected to mention that the rider is okay, though the bike has a tacoed rear wheel. Good news and — to me, at least — maddening news on the legal front. Cyclist and attorney Dj Wheels reports that the judge has denied a motion to suppress evidence in the case of Shawn Fields; the allegedly drunk hit-and-run driver is accused of killing 17-year old cyclist Danny Marin in Pacoima last October. The defense had argued that police did not have a warrant when the entered Fields’ house after he did not respond when they saw him sleeping inside. As a result, they wanted everything officers observed after entering the home suppressed, as well as the results of blood alcohol and field sobriety tests. However, the judge ruled that the police did the right to enter the home based on probable cause and exigent circumstances. The next court date is pre-trial hearing scheduled for September 20th at the San Fernando courthouse, case # PA068775. Meanwhile, in the case of Patrick Roraff, the teenage driver accused of killing pro cyclist Jorge Alvarado while street racing in April of last year, has had his pretrial hearing delayed until September 1st, case #SB – FSB1002475. Wheels reports that attorneys for Roraff and co-defendant Brett Morin have both filed motions to have their charges dismissed for insufficient evidence; Roraff has also filed a motion to have his charges reduced from felony manslaughter to a misdemeanor; I’m told that both motions are routine. Don’t go looking him around here next month, though. Despite the seriousness of the charges he faces, the judge had given Roraff permission to travel to Texas with his school soccer team. Despite — allegedly — killing another human being because he couldn’t resist the urge to illegally race another driver, he gets to play soccer with his friends, while Jorge Alvarado’s family and loved ones face going on without him. Am I the only one who finds that more than a little infuriating? The California Bicycle Coalition calls for action to support AB 345 to give cyclists and pedestrians the voice with Caltrans we should have had all along. Intriguing idea, as Streetsblog’s Damien Newton reports — and supports — an idea floated by the city’s Bicycle Advisory Committee to elevate the planned Expo Bikeway over several busy Westside intersections. And speaking of Streetsblog, Damien looks at bike-friendly Long Beach this week. Looks like someone is deliberately trying to sabotage courses for next week’s USA Pro Cycling Challenge in Colorado. Evidently feeling a need to attack all former Tour de France winners, Floyd Landis accuses Alberto Contador of doping by association; he’s no doubt looking for dirt on Cadel Evans as we speak. Meanwhile, the Cadel effect results in an upsurge of interest in cycling Down Under. Vincenzo Nibali will defend his title in the Vuelta. Twenty-year old Portland racer Jacob Rathe goes pro with top-tier team Garmin-Cervelo; evidently, Taylor Phinney isn’t the only pro cycling prodigy. A writer for the Baltimore sun reminds us that bikes can kill, too. However, a tiny bit of perspective might be helpful — you can count the number of people killed by bikes each year on one hand and still respond with the inappropriate gesture of your choice, while motor vehicles kill well over 30,000 people a year in the U.S. alone. Of course, the people who hate bikes also tend to forget that colliding with a pedestrian is just as likely to result in serious injuries or death to the cyclist. And it isn’t always the cyclists’ fault. But maybe the solution is as simple as better infrastructure. LACMA will offer a free screening of Pee Wee’s Big Adventure this Friday. More on the new 7th Street road diet and bike lanes from EcoVillage, CicLAvia and LADOT Bike Blog; I rode them myself Wednesday evening, but I’ll save that story for another day. Bicycle Fixation offers a lovely look at a bike Sunday in Santa Monica. CicLAvia expands into South L.A. and Olvera Street and Chinatown. C.I.C.L.E. says studies show exercise increases lifespan, so why aren’t we? A look back at biking in L.A. circa 1901. Photos from the newly upgraded section of the Ballona Bike Path in Culver City. UC Irvine makes a dent in campus bike thefts by arresting five suspected thieves, one for the third time; does the third strike law apply to bike theft? Meanwhile, Manhattan Beach police arrest another four bike thieves; 9 down, a few thousand or so to go. 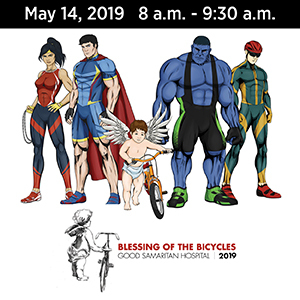 Live 4 Bikes, a new bike shop is officially opening in Bellflower this weekend, and offering free tune-up for the first 50 customers. Temple City plans to install protected bike lanes on Rosemead Blvd. The Claremont Cyclist asks why the recent stories about deaths in Yosemite ignored the park’s leading killer. Sometimes, when everything goes wrong it turns out better. After a flurry of activity by local advocates, Newport Beach’s illegal, though long-standing, ban on bikes on a local street is coming down, despite claims that it really wasn’t a ban after all, despite what the sign says. L.A.’s own former National Criterium champ Rahsaan Bahati wins the Ladera Ranch Grand Prix; San Diego’s Trina Jacobson takes the women’s crown. San Diego hosts a successful Courteous Mass. Drivers complain about cyclists, cyclists complain about bikers. A Fairfield cyclist suffers life-threatening injuries after witnesses say he ran a red light and rode into the path of a turning car. A bill increasing penalties for using a hand-held cell phone or texting while driving goes to the Governor’s desk — and extends the prohibition to cyclists, as well, so hang the damn thing up when you ride, already. More evidence that bicycling is a lot safer than people think; still, Bob Mionske says it’s a good idea to wear a helmet — legally as well as medically — even if you don’t have to. It may be the end of the road for motormania. Utah hit-and-runs are on the rise as more people ride bikes. A beginner’s guide to safe cycling from my hometown, good advice that would work anywhere. More on the Black Hawk bike ban going to the Colorado Supreme Court. Compete Streets is now the law in New York state. There’s good news for NYC cyclists as the lawsuit against the popular Prospect Park West bike lanes is dismissed. After a shattering hit-and-run, New York police do…not much. Another day, another Daily News hack job on Gotham cyclists; judging by their reports, Daily News reporters would rather deal with a zombie apocalypse than an infestation of bike riders. Defining bikers, cyclists and rolling pedestrians. The New York Times says Florida pedestrians have to run for their lives. A look at the infamously popular Rosarito-to-Ensenada bike ride coming up next month. A Canadian street performer has his prop bike stolen during his act. Victoria police crack down on cyclists for not wearing helmets. A UK motorist is convicted of using two mobile phones to talk and tweet at the same time while driving — and making the police wait while he finished his call. No, seriously. Bike theft is a problem in the UK as well, as a 14-year old rider helps bust a bike theft ring. Free-to-use bike pumps appear in London. Why Cambridge is a model cycling city. Now you can ride your bike to look for Nessie. The first improved roads were built for and by cyclists, before they were co-opted by motorists. Seville, Spain experiences a 100 time jump in cycling levels in just four years, which would probably put the Daily News writers in a padded cell. Finally, Danny MacAskill is back, doing the impossible on two wheels. And writing for Bicycling, pro cyclist Ted King says enjoy — truly, consciously enjoy — your next ride. And your life. Now that’s a philosophy I can get behind. According to the Highland Community News, Patrick Roraff is sorry he killed pro cyclist Jorge Alvarado last April. In a brief story about the case going forward against Roraff and co-defendant Brett Morin for the alleged street racing collision that killed Alvarado, the paper mentions that Roraff wrote a letter apologizing to Alvarado’s family — as well as telling investigators how much he regretted his actions. Unfortunately, no amount of remorse will bring the rising pro rider back to life. Then again, no amount of punishment will either, no matter how much jail time the two teenage drivers receive. Thanks to Dj Wheels for the heads-up. Update: I received an email from an L.A. cyclist named Bret Morin, who pointed out that I had misspelled the name of the driver charged in Alvarado’s death as Bret, rather than Brett. My sincere apologies to the other Bret Morin for any inconvenience this may have caused. Surely no one is really surprised by this. Damien Newton reports that cyclists are in conflict with L.A.’s notoriously risk-averse agencies over plans for environmental review of projects in the new bike plan. You didn’t think the fight was over once the plan was unanimously passed by the city council, did you? Jessica Simpson and Eric Johnson ride a tandem in Venice, which brings up one of my pet peeves. For those unclear on the subject, the world-famous Venice Boardwalk is that crowded sidewalk between the stores and the beach where bikes are banned. That narrow strip of asphalt where Simpson and Johnson rode last weekend is the world-famous Marvin Braude, formerly Venice/Santa Monica, Bike Path, where bikes are actually allowed and pedestrians banned. 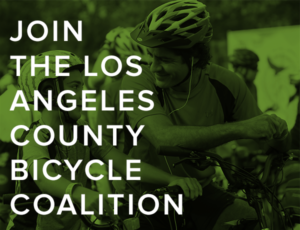 LACBC calls for volunteers for this weekend’s Culver City bike count. The West Hollywood Bicycle Task Force meets this Wednesday at 6:30 pm. Bikerowave is hosting a bike swap meet this Sunday. Source readers overwhelmingly approve of removing bike restrictions on Metro trains. Fourth District Councilmember Tom LaBonge rides next to the L.A. River; public television station KCET offers a field guide to biking it yourself. Harry Dougherty offers great photos from last weekend’s Sunday Funday ride, as well as the L.A. River clean-up. Santa Monica Spoke will host a bike exhibition at the 20th Annual Santa Monica Festival. Gary Kavanagh says Santa Monica could be the envy of the bicycling nation. Hermosa Beach invites you to an all ages bike playdate on Saturday the 14th. SoCal’s bike-friendliest city celebrates Bike Month. The Claremont Cyclist offers local bike news, including the new Citrus Regional Bikeway. The Amgen Tour of California will bypass the scenic central coast due to a massive landslide. Astronaut Grover says wear your helmet. It’s Bike Month, so get out there and don’t proselytize. What to consider when you get new tires. Then again, maybe you’re overinflating your tires; based on this, I may try dropping my front tire a little. What’s your motivation to ride to work? The League of American Bicyclists shifts their focus from educating cyclists to educating the drivers who threaten us, and wants your help to do it; they also release the latest list of bike-friendly cities. No surprise cycle tracks save lives. Touting the environmental benefits of cycling could do more harm than good. People for Bikes says 2011 could be the year of the bike. The perfect accessory for your designer handbag could be the new Kate Spade bike. Lovely Bicycle ponders why some towns aren’t cycling towns. Participants in New York’s popular Five Boro Bike Ride seem to spend more time walking than riding. The Washington Post implies cyclists are the only ones who need to obey the law, while Wash Cycle deftly dismantles their arguments. DC cyclists are threatened by drivers, as well as the roads they ride on. Maryland adds tougher penalties for negligent drivers who kill cyclists. A cyclist is killed by a hit-and-run driver in North Carolina after falling in the street, even though his friends tried frantically to stop the oncoming driver; thanks to Zeke for the heads-up. Florida cyclists may get a chance to ride a local causeway legally. The legal deadline has passed for Lance Armstrong to sue Floyd Landis over doping allegations. Canadian parents are charged with letting their nine-year old son ride without a helmet after he’s hit by a car. Maybe if you rode with a halo around your head, you might not end up with one. A nurse saves the life of a man who collapsed during a triathlon, then finishes the race herself. Town Mouse wonders if we’re teaching our children the right lessons. An 81-year old UK man dies after a collision with a cyclist. Great mostly bike-related artwork. Good road design makes peace break out between cyclists and drivers. Sydney homeowners discover living near a bike path is good for property values. Finally, if you’ve already jumped bail after being ordered not to drink, don’t get drunk and ride your bike into a parked patrol car. I was really hoping I wouldn’t have to write this. Last night, the CHP reported a collision involving a cyclist in the Indio area; the cryptic feed indicated that the coroner had been called. As I searched for confirmation, though, I found another report online that said the coroner call had been cancelled, and the rider had been transported to the hospital with major injuries. The CHP feed was later updated to indicate that, as well. Unfortunately, the good news didn’t last. According to a story in the Desert Sun, 39-year old Travis Carroll was pronounced dead at 8:17 last night, after being hit by a van while riding on Avenue 42 in Bermuda Dunes. The collision occurred between Washington and Adams Streets at around 7:35. The sparse description of the collision in the Desert Sun doesn’t really make sense. However, that raises the question of why he would cross the path of an oncoming vehicle which should have been clearly visible as he faced it — especially since the paper reports that alcohol does not seem to be a factor. According to reports, the investigation is ongoing. The same day Encino endurance cyclist Jim Swarzman was laid to rest at Forrest Lawn, word came that the driver suspected of killing him was released from custody. According to San Diego’s KGTV, Joseph Ricardo Fernandez was released at the last moment before being arraigned. Reportedly, the reason stemmed from the three day limit authorities have to file charges after taking the suspect into custody. The station indicates that the delay is due to ongoing forensic work to ensure that Fernandez’ Dodge Ram 1500 pickup was in fact the vehicle that took Swarzman’s life; following that, the DA needs to be able to show that Fernandez was actually the one behind the wheel. I would hope that they are also investigating his actions before the collision; I suspect they may find that he was drinking heavily. The reports I’ve heard say the collision was extremely violent; I’ll spare you the details, but it would have been virtually impossible for the driver to have been unaware he hit something, putting to question Fernandez statement to the police that he thought he might have hit something. Unless he was in a significantly altered state, the driver had to know damn well that he hit something, making his flight afterward a purely intentional — and illegal — act. The investigation is ongoing, and I have no reason to believe the San Diego DA’s office isn’t taking this case very seriously. But we may want to keep on top of it, just in case. 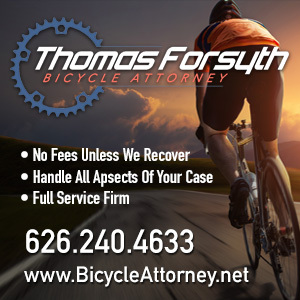 I’ve been on the run the last few weeks, and haven’t had a chance to update the ongoing legal cases (my apologies to cyclist/attorney Dj Wheels, who has done a great job of keeping me abreast of the ongoing cases). Wheels reports that the trial has begun in the case of Marco Antonio Valencia, charged with killing Joseph Novotny and seriously injuring three other riders in an alcohol and drug-fueled hit-and-run. Chad Lewin, 25, was riding in front of Munana and Novotny during the ride. As Lewin was riding around a right turn, he saw the bicyclist in front of him slam on his brakes abruptly. To avoid crashing, Lewin testified that he swerved into the roadway to his left to avoid crashing. In an instant, he was knocked to the ground by the truck. As he slid, Lewin said his skin was ripped off — in some instances to the muscle. “As I was sliding backward, I saw Joe 20 feet in the air and hit the mountainside,” Lewin said. It appears that Valencia’s defense will mainly focus on avoiding the “Watson” 2nd degree murder charge by arguing that although he was awake and able to drive, he was not “conscious” of his actions and thus did not have the required specific intent for murder, which would be implied malice. I don’t know all the case law on these types of DUI murder charges, but essentially Watson says when you have been previously convicted of DUI, you should know all ready that driving drunk can cause serious injury or death, which would establish the intent requirement of malice. The CA legislature later enacted CVC 23103.5. As a resulty, many county courts and district attorneys offices for several years now have required defendants to sign a declaration admitting that you acknowledge these risks and that you may be charged with murder if someone dies as a result of their drunk driving. I believe this declaration can also be used as evidence. So my guess is that the defense will try to establish that none of the witnesses actually saw the driver of the vehicle (specifically his face/body) in the seconds before the collision and during the collision in order to establish a reasonable doubt about whether he was indeed “conscious.” I think the only defense witness will be the expert who will testify that someone can be unconscious due to voluntary intoxication, but still be awake. As long as we’re on the subject of biking collisions and court cases, we might as well keep going. Danae Marie Miller will be arraigned today on one count of felony vehicular manslaughter with gross negligence while intoxicated in the death of world-class trialthlete Amine Britel in Newport Beach last month. She’s currently out on $100,000 bail. John Stesney reports that a pretrial hearing is scheduled next week in the death of local scientist and cyclist Doug Caldwell. The hearing for accused driver Gordon Catlett Wray will take place at the San Fernando Courthouse, 900 Third Street in the city of San Fernando, on Wednesday, April 20th at 8:30 am, case #0SR05313. My sources indicate that despite numerous questions that have been raised that the defendant was using a cell phone at the time of the collision, the prosecutor either can’t get the records, or won’t request them for some reason — even though they could offer proof of distracted driving in fatal collision. Maybe a few cyclists in the courtroom could stiffen the DA’s resolve, and show how seriously we’re taking this case. Dj Wheels reports that Shawn Fields was arraigned on March 30th for the heartbreaking hit-and-run death of 17-year old Danny Marin in Pacoima last year; a description of the injuries suffered by Marin — again, I’ll spare you the details — suggests another extremely violent collision. According to the arresting officer, Fields was asleep at home by the time they arrived at the location where the vehicle was registered. He wouldn’t wake up at first after knocking and banging on the windows from where they could see him sleeping. Fields also volunteered a statement before being taken to the police station that he shouldn’t have driven home because he had too much to drink at a wrap up party at the Roosevelt in Hollywood. He also saw many bottles of various alcoholic beverages inside Field’s house. Also, the officer that administered the breath test at the station noted that his BAC was .14/.15 at about 4:15 a.m. The collision occurred about three hours earlier. The investigating officer who interviewed Fields at the station also testified. Fields told him he got to the party around 10pm and drank a long island ice tea, a red label whiskey, a gin and tonic, beer and some water before leaving. After walking out, he had a bacon wrapped hot dog on the street, threw up on himself, debated whether to drive home, waited in his car for a while then finally drove. He did not have a recollection of actually driving home, but recalled he may have hit something because he remembered being at a stop light close to home and looking at sparkly dust on his arms from the shattered front windshield. A preliminary hearing is scheduled for April 28th at 8:30 am in the San Bernardino Superior Court in the case of Patrick Roraff and Brett Michael Morin for the street racing death of pro cyclist Jorge Alvarado last April. A preliminary hearing is also scheduled for May 11th in the case of Stephanie Segal, charged in the drunken hit-and-run death of cyclist James Laing in Agoura Hills last October. Jim Lyle forwards news that Richard Schlickman, the cyclist critically injured when he lost control of his bike due to newly installed speed bumps in Palas Verdes Estates, is showing amazing progress and determination, and may be transferred to a rehab facility by the end of the month. Meanwhile, reports are that your prayers continue to be needed for Adam Rybicki, critically injured by an alleged underage drunk driver in Torrance on April 3rd.